Police and Crime Commissioner, Peter McCall has welcomed the support from the public and the Police and Crime Panel on the proposal to increase the policing part of the council tax as part of the budget setting process. It is proposed that the policing council tax precept would be increased by 5.42% for the next financial year 2018/19. This is an increase of £11.97per year for a band D property and takes the total policing element of the council tax at Band D to £232.74 per year and a Band B increases by £9.31 to £181.02 per year. 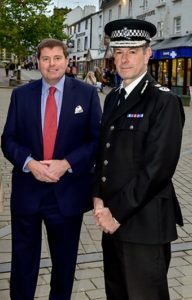 Police and Crime Commissioner, Peter McCall said: “It is a very difficult decision to propose an increase in the Police Precept. I have listened to the public who want to see more of the police not less. Therefore, I would like to thank the public of Cumbria for their clear message of support to increase the policing part of the council tax. This positive position has been further endorsed unanimously by the Police and Crime Panel at their meeting today. “An increase in council tax is never welcome but I firmly believe that your safety is paramount. 2. 95 PCSOs* guaranteeing the delivery of a strong pro-active visible presence in your community. “This will be a real boost to front line policing addressing your local concerns such as anti-social behaviour and at the same time meeting the emerging pressures rising demand such as online-crime. Chief Constable Jerry Graham said: “I’d like to thank everyone who supported us during this recent consultation. I believe this additional money will have a significant impact on the quality of local policing services we can offer in your communities. 1,500 people took part in the online survey with 71.87% voting to support the increase in council tax precept.